Bricscad V 11.3.10.1 is a minor update if you go by the numbering increment but it is a significant update in terms of what it offers. 1. .Net API for programming: With the addition of the .NET API for Bricscad, you now have access to yet another programming platform for Bricscad and the opportunity to re-use .NET modules written for other CAD systems. 2. Support for TABLE object and TABLE styles: The TABLE object which was introduced in AutoCAD couple of years back is now fully support in Bricscad, along with the ability to set TABLE styles as well. 3. 3D-solids-to-2D-drawings flattening: A new SOLPROF command added in this version allows 3d solids to be projected onto a 2d plane parallel with the current viewport. The resulting 2D entities are placed on separate layers for hidden and visible lines. 4. Spline to Polyline conversion: With the PEDIT command, you can now convert a SPLINE object to a polyline. - GRIDAXISCOLOR, GRIDMAJORCOLOR, GRIDMINORCOLOR, GRIDXYZTINT (bricscad only). 8. The BREAK command now supports breaking a SPLINE object. GT_VIEWLINKED: (GeoTools -> Export Tools -> View handle-linked objects): Using the GT_VIEWLINKED command, you can view and correlate information between an ASCII/CSV file and its drawing by selecting a record and have the command zoom to the corresponding object in the drawing. The handle of the object is used as a key to make this connection. Using the GT_IMPEX command, you can export the object handle into an export file. When used in conjunction with GT_IMPEX command, this provides a useful debugging tool to view and check output records. These twin commands have been modified to recognize and handle polylines in local coordinate systems (UCS). In other words, if you have polylines which are in UCS, or if the current coordinate system is not the World Coordinate System, the conversion will result in polylines getting converted and remain in their own coordinate system. This gives more predictable and desired results when handling UCS polylines. Please be aware that these commands do not change the coordinate systems of the polylines. To do that, you must use the GT_FIXUCS command. GeoTools uses doslib ARX files internally. These libraries were upgraded recently and V12.02 now uses the new, updated doslib libraries which have been optimized and compiled for AutoCAD 2012 version. The earlier doslib libraries had some bugs while opening some MFC-based file dialogs in Windows 7, 64-bit operating systems. For example, the GT_MULTINS, GT_GEO_INS etc are some of the commands which could have caused a system freeze in some Win7-64 systems. This has now been fixed. GT_EASYATTCLASS (GeoTools -> Block Tools -> Change block layers/color based on attribute values): The GT_EASYATTCLASS command changes the layer and/or color of the selected blocks based on the values of the attributes. 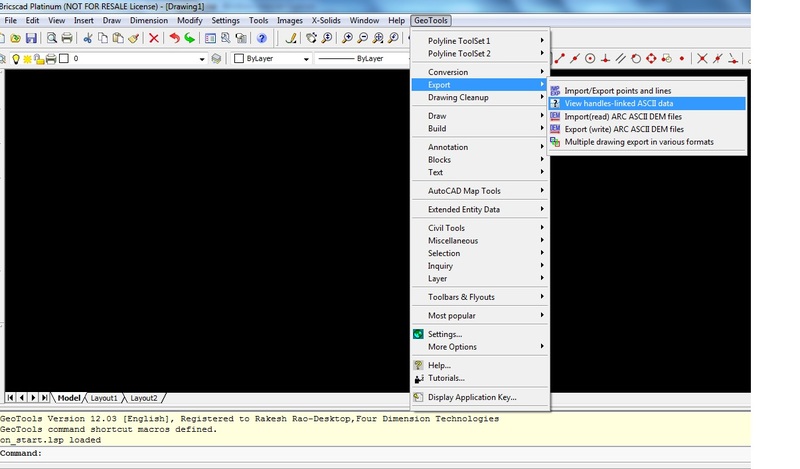 The parameters required for this command, namely the values of attributes and the layer/color to be used, are set using the GT_EASYATT_SETUP command. The GT_EASYATT_SETUP command is now a common setup command for the GT_EASYATT command also. For example, if you have an attribute called CONSTRUCTION_STAGE, and if the possible values are "InProgress", "Completed", "Demolished", you can change the blocks to go to their respective layers or have different colors depending on these values. GT_DYNATTPLACE (GeoTools -> Block Tools -> Place blocks - position attributes interactively): Using this command, you can now place blocks with attributes and move the attribute positions interactively. GT_INSVX (GeoTools -> Polyline Tools Set 1 -> Insert Vertex): A bug has been fixed in the GT_INSVX command. The Z value of the new vertex location is now the correctly interpolated Z value of the nearest point on polyline. Earlier, all new inserted vertices would acquire an elevation of 0.0. This has been fixed. Until GeoTools V11, all English language license files for all versions were named simply as 'GeoToolsUser.rgs', whether it was for the AutoCAD platform or Bricscad. This has changed with V12. The GeoTools license file will now have the format 'GeoToolsUser12_[EN,ES,DE]_[AC,BC].rgs'. '12' indicates the version number. EN / ES / DE specifies the operating language - English, Spanish and German respectively. The AC / BC specifies the operating platform, either AutoCAD/Bricscad. So, a license file named 'GeoToolsUser12_EN_AC.rgs' means it is a GeoTools V12 license file for the English version running on AutoCAD. This file naming convention will help you and us a great deal in understanding and sorting out support related issues. GT_COMPAREBLKATTS (GeoTools -> Block Tools -> Compare Block attributes and create report): The GT_COMPAREBLKATTS command has been enhanced. Until now, it was only capable of creating a report of block names in the drawing having identical tag names. It can now create a report of block attributes that have similar block attribute values as well. In other words, if you need a report of block attributes with unique values (number of such occurences), this is the tools to use. An 'Undo' option has now been added to both these commands which will allow you to undo each operation of vertex insert or delete without having to undo or redo the whole command. (geo) (GeoTools -> Miscellaneous Tools -> More -> Enter geographical coordinates-Latitude,Longitude,Height): (geo) is a transparent function that can be used to input a geographic point. You can now input the latitude or longitude locational qualifiers like N, S, E and W following the value. For example, 55N 23 21, 25E 12 23,0.0 is now a valid input. N and E qualifiers are taken as positive coordinates, S and W qualifiers are taken as negative coordinates. Accordingly, the sign of the coordinates become positive or negative. Earlier, you had to specifically give a negative (-) sign in front of the value to denote the negative. This method is still supported. GT_GEO_INS (GeoTools -> Miscellaneous Tools -> Insert a geo-referenced image): A bug has been fixed in this command which was causing a malfunction in the past few updates of GeoTools V11. Minor enhancements have been made in the default folder naming convention. The location for the 'World files' folder is now automatically set to the same folder where the image file was found. If your 'World Files' folder happens to be the same as the images folder, you just need to click on 'Ok' to the 'World files' folder dialog and proceed further.